Surface action is not going to be there every day in a consistent fashion. When it is there, it will be squeezed into a tight two hour time period, typically early to mid-afternoon. Go with tandem midge rigs and target the inside turn and current margin of riffles as well as eddies with slow currents. 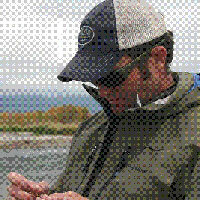 Dry flies – Furimsky BDEs, Renegades, Mating Midges, CDC Wing Midge Emergers, Snowshoe Midges, and Parachute Midges. Nymphs – Zebra Midges, Ice Cream Cone Midges, Dorsey’s Mercury Midges, Mercer’s Midgling, Booty’s day-2 Midge Pupa, Yarn Eggs, and Veiled Eggs. What we are seeing on the South Fork mirrors what we are experiencing on the Snake. Midge pupa and larva imitations are working best, although there is decent action on BWO and caddis imitations as well. Go light with your nymph rigs and no more than seven and a half feet from line-leader joint to your trailing fly. Target riffles, seams, and the tail of riffle pools. Structure can be worth targeting as well. Egg patterns are working in the same water and are out-performing eggs on the Snake by a smidgeon. Surface action on midge adults is occurring at the tail of riffle pools, riffle current margins, and on slow current flats that are two to three feet in depth. Midge emergers are worth fishing as part of a tandem rig. Dry flies – Furimsky BDEs, Griffith Gnats, CDC Wing Midge Emergers, Snowshoe Midges, Parachute Midges, and Air-Flo Tricos. Nymphs – Lightening Bugs, Redemption BWOs, Zebra Midges, Ice Cream Cone Midges, Dorsey’s Mercury Midges, Mercer’s Midgling, Booty’s day-2 Midge Pupa, Otter’s Soft Milking Eggs, Clown Eggs, Yarn Eggs, and Nuclear Eggs.